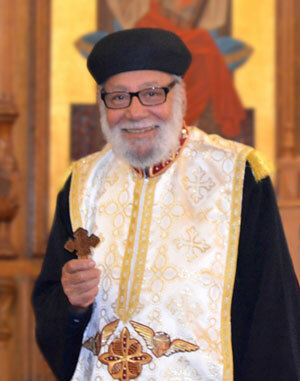 With a firm hope in the Resurrection of our Lord Jesus Christ, we announce the departure of the blessed servant, our beloved Hegumen Father Angelos Youssef, who reposed in the Lord earlier this morning. The family will be receiving condolences tomorrow (Sunday July 1st) from 6 to 8 pm at Holy Virgin Mary Church in LA. The funeral will be celebrated next Saturday (July 7th) at 11 am also at Holy Virgin Mary Church, preceded by the Divine Liturgy. Father Angelos Youssef was born on July 2, 1929. He earned an MBA degree in Accounting and a CPA designation. He served as Treasurer and member of the Board of Deacons of Holy Virgin Mary Church in Los Angeles, California for many years since her inception. He was ordained Deacon Stephen by His Grace Bishop Serapion on August 30, 1998, and was promoted to the rank of Archdeacon on October 23, 1998. On May 23, 1999, His Grace Bishop Serapion ordained Archdeacon Stephen as a general priest. He served primarily at Holy Virgin Mary Church in Los Angeles, and also served other churches of the Diocese including Saint Mary Magdalene, Palm Springs and Saint John the Baptist, Oxnard. Father Angelos served Saint Mark Church in Honolulu, Hawaii from 2002 to 2006. During that time he earned a Masters Degree in Pastoral Theology from Chaminade University. Most recently, he was a co-servant at Holy Virgin Mary Church, Los Angeles and assisting in financial matters of the Diocese. May the Lord repose the pure soul of our beloved Father Angelos in the Paradise of Joy, and may his memory be eternal!